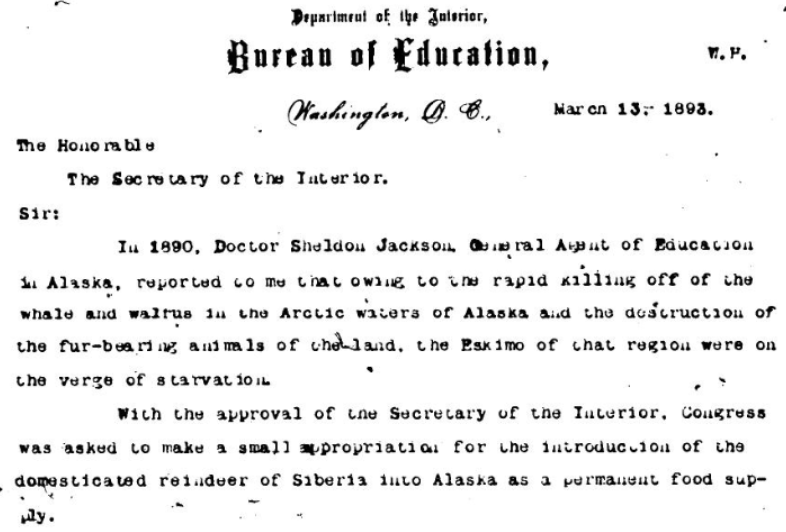 In 1890, Doctor Sheldon Jackson, General Agent of Education in Alaska, reported to me that owing to the rapid killing off of the whale and walrus in the Arctic waters of Alaska and the destruction of the fur-bearing animals of the land, the Eskimo of that region were on the verge of starvation. 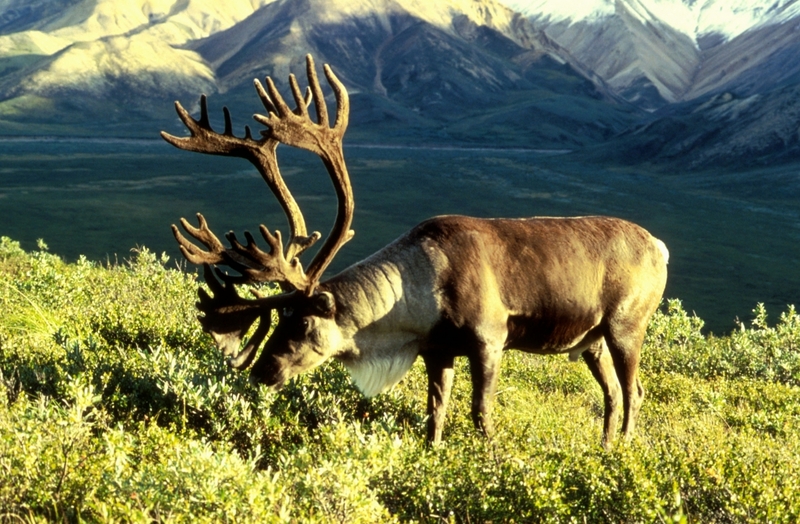 With the approval of the Secretary of the Interior, Congress was asked to make a small appropriation for the introduction of the domesticated reindeer of Siberia into Alaska as a permanent food supply. 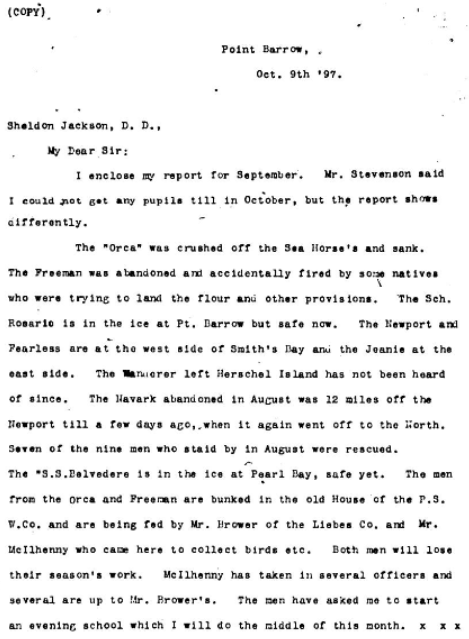 Jackson had initially encountered native herders in Siberia during a trip to reimburse the Russians for their aid to shipwrecked American whalers. 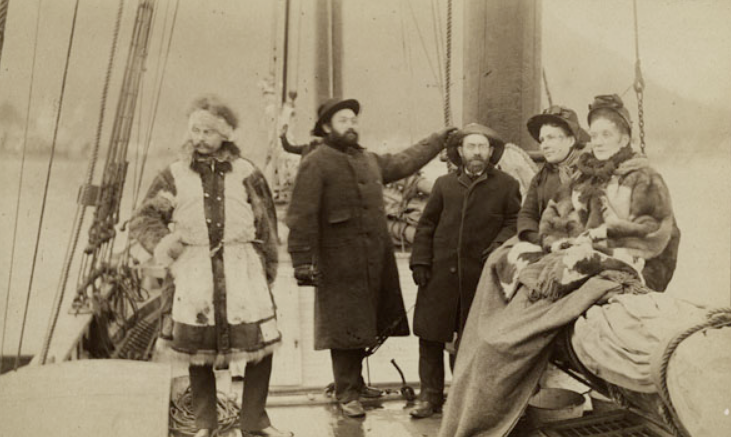 On that same voyage he was also tasked with conducting a rudimentary census of those dwelling on the Alaskan coast. He gradually conceived of combining agricultural experiment stations with schools (and mission posts), and thus began America’s foray into livestock introduction in the Arctic. The initial stock of several hundred reindeer was funded by $2,200 raised by public subscription in 1891 when Congress failed to act on an appropriation. The U.S.S. Revenue Cutter Bear was placed at Dr. Jackson’s disposal as a means to retrieve and distribute the animals. Congress would rise to the occasion with an appropriation of $6,000 in 1893. Trainers were also imported, initially from Siberia and later from Lapland. As Jackson surmised, reindeer were the perfect animal with which to meet a number of pressing needs in the backcountry. Their greatest advantage lay in their diet: they ate moss or lichen whereas dogs are carnivores. Reindeer also provided meat, skins, and even bones and antlers from which indigenous people fashioned tools or decorative items. Reindeer pulled on average 300 pounds per animal on a surface of packed snow, covering from 50-90 miles per day depending on the terrain. They could be raised in herds, and teamed just as dogs were. In a leap of imagination Jackson pitched the reindeer program as industrial education for children beyond the reach of more prosaic schools in the Lower 48. In the extension of the school system to northwestern and arctic Alaska, it has been found that, owing to the environment, the only industry that can be taught with success to Eskimo boys is the herding, management and propagation of domestic reindeer. The importance of this one industry has been further pressed upon the attention of the Bureau by the fact that the whale and walrus, constituting a large part of the natural food supply of the natives on the coast, have been destroyed or driven beyond their reach. If the word “evangelist” comes to mind while reading these excerpts from Jackson’s letters, it’s altogether fitting as Jackson was himself a Presbyterian missionary. 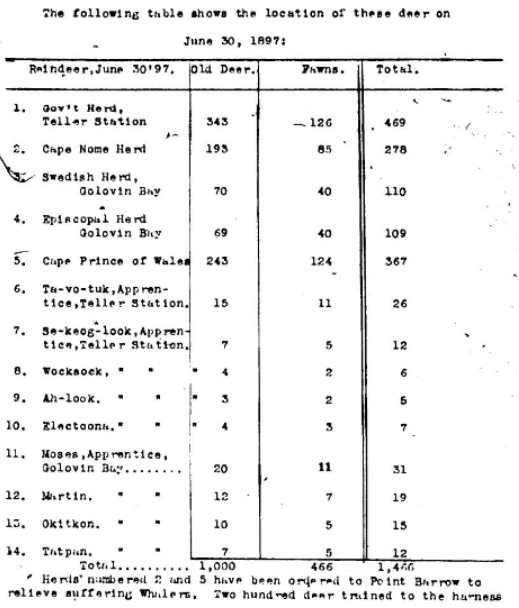 The herding stations typically coincided with mission posts whose adherents were compensated for their work on behalf of the government. I enclose my report for September. Mr. Stevenson said I could not get any pupils till October, but the report shows differently. The “Orca” was crushed off the Sea Horse’s and sank. The Freeman was abandoned and accidentally fired by some natives who were trying to land the flour and other provisions. The Sch. Rosario is in the ice at Pt. Barrow but safe now. The Newport and Fearless are at the west side of Smith’s Bay and the Jeanie at the east side. The Wanderer left Herschel Island has not been heard of since. The Navark abandoned in August was 12 miles off the Newport till a few days ago, when it again went off to the North. Seven of the nine men who staid by in August were rescued. 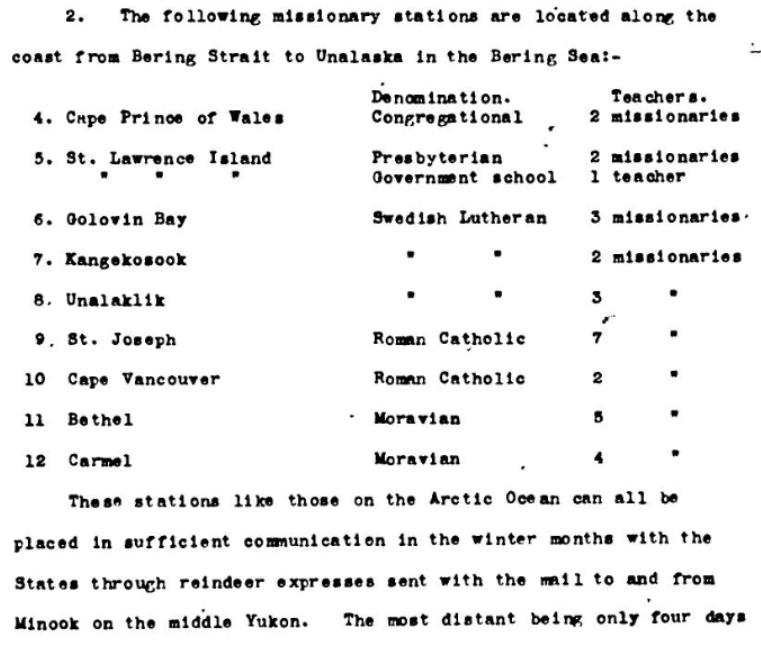 Jackson’s reindeer program extended beyond the deer themselves to include the people who cared for them and the culture which supported both. And then there were the logistics. When the Siberian herders proved as unmanageable as the deer, Jackson sought both instead from Lapland, in northern Finland. The greater distance from Alaska entailed an arduous journey that took place within those few months when storms and ice made travel to and from northern climes feasible. On the second and third we loaded upon the ship 538 trained reindeer, 418 sleds and 511 [sets] of harness; also trained Lapp drivers, together with their families, making 113 persons sailing on the morning of the fourth. The trip of over 4000 miles to New York consumed 26 days, during nine of which we were in a severe gale off of Iceland. 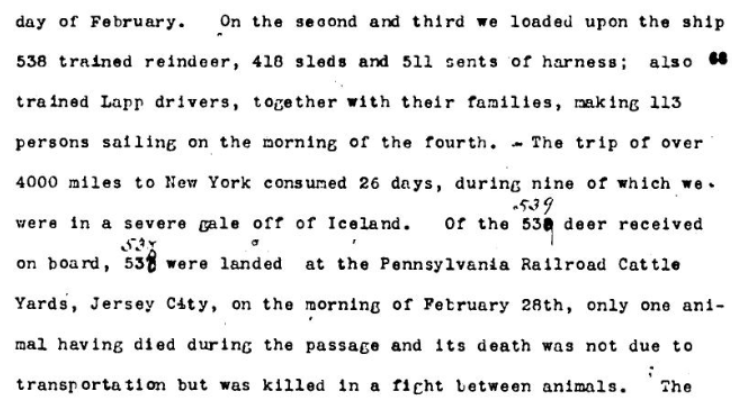 Of the 539 deer received on board, 538 were landed at the Pennsylvania Railroad Cattle Yards, Jersey City, on the morning of February 28th, only one animal having dies during the passage and its death was not due to transportation but was killed in a fight between animals. I have the honor to state that the large stock of reindeer recently purchased in Lapland consists entirely of male reindeer trained to the harness and is entirely useless for the purpose of forming a herd like the one recently at Port Clarence, and at present at Unalaklik whither it has been moved for sanitary reasons during the present winter. 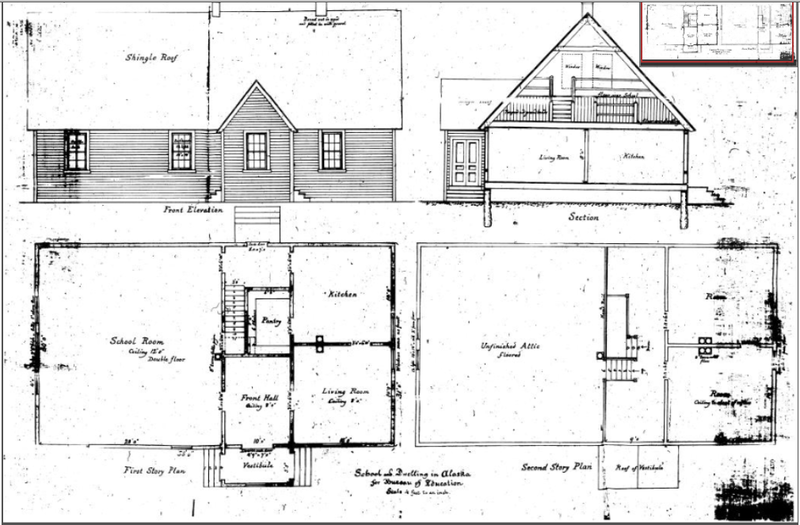 As shown below, Jackson’s schools would ultimately take on a more finished appearance by the time he died in 1907. He was successful in his efforts at reindeer introduction to the extent that herding continues to this day. And were his successors to undertake a similar program in the twenty-first century, it’s conceivable that those deer would indeed fly through the magic of commercial aviation. For more information about Territorial Papers of the United States, 1764-1953, please contact Readex Marketing.